Stylish retro, pub/restaurant, with a well thought-out old-school meets modern vibe brought to like by retro-cool décor to the original seventies furniture.Situated right at the end (or the beginning depending on where you start!) 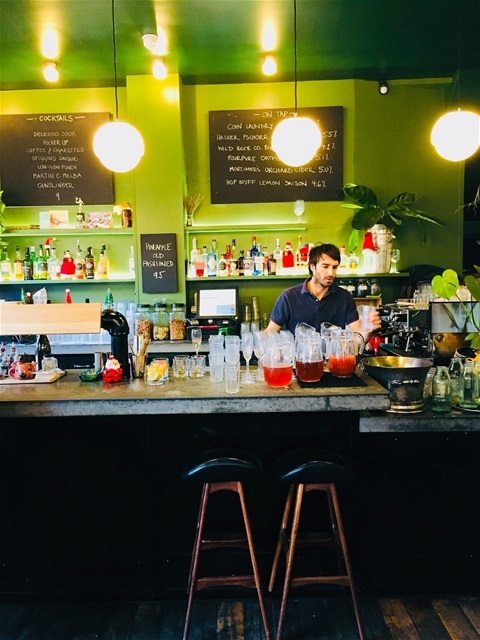 of super cool Exmouth Market, which is bursting with cool little independent restaurants and bars, Coin Laundry definitely belongs. With a manageable but top quality menu and a great specials board that changes daily, choose from fresh and delicious gourmet classic dishes such as prawn cocktail, deep fried sprats, Chicken Kiev, Cauliflower cheese etc.. and all created in the open kitchen as you watch. Open all day for breakfast, brunch, lunch and dinner, the seating is limited, so please book in advance, there are even less places to sit if you just want a drink (or handmade cocktail) at the long bar and if you do mange to get a table then your always welcome to sample their wide array of retro cocktails with modern twists or their collection of tasty craft beer. A great place to spend your time at, eat, drinking or just catching up with friends/family. All welcome!